Hedvika Švendová began to play the guitar at the age of four with her mother Hana Švendová. Later she studied at the Elementary Art School in Choceň with Petra Poláčková and the Elementary Art School in Ústí nad Orlicí with Jiří Tomášek. Since 2011, she has been studying with Petr Saidl at the conservatoire in Pardubice. Apart of receiving many prizes at guitar competitions, she also holds numerous special awards, including the title ‘Young Talent’ awarded by the hetman of the district of Pardubice, an award given by the Czech Television Competition ‘Zlatý Oříšek’ (Golden Nut) (2009) and the title ‘Young Guitarist of the Year’ at the International Guitar Biennial in Kutná Hora (Czech Republic). 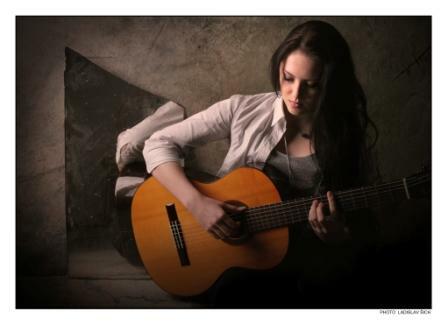 In the last two years, she has given concerts at some of the most important guitar festivals in Europe: Mikulov, Křivoklát, PRAGuitarra Clássica (all in the Czech Republic), Forum Gitarre Wien (Austria), Lanckorona (Poland), among others. In 2013, she performed the Guitar Concerto No. 1 by Mario Castelnuovo-Tedesco with the South Bohemian Philharmonic Orchestra in the Dvořák Hall of the Rudolfinum in Prague. In addition to the guitar, Hedvika also plays the flute, violin and piano. In 2013, she won 1st prize for flute at the Czech conservatoire competition. She plays on an eight-string guitar made by Petr Matoušek. You can follow her on YouTube. If you are interested in working with Hedvika, please get in touch with the EMCY Office.